After pricing decks we saw an ad for Curb n Decor. We contacted Bowie and found him to be the most resonable, all things considered. Bowie and his crew did such a great job we had him install curbing around our landscaping. I could not recomend him any higher. I normally do not give 5 ratings, but he deserves it. Professional. Beautiful work. Surpassed our expectations (by miles). Reasonable Prices. Thanks for all you & your crew did to create a one of a kind patio for us!! Curb 'n Décor LLC is a one stop shop for all landscaping services. 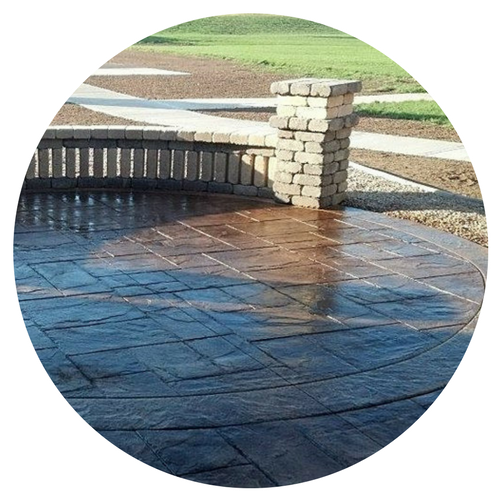 Our professional staff install decorative landscape curbing, stamped concrete, broom finish concrete, hardscapes, retaining walls, seating walls, and many other landscaping projects. Every customers has a unique project where our skills are used to install quality pieces of art that are aesthetically pleasing while providing functionality. We use quality supplies from vendors we trust and have lasting relationships with. Let us use your yard as yet another one of our canvas' to bring artistry to life. Curb ‘n Décor LLC was founded with one goal in mind – to provide a full range of superior landscaping services at affordable rates to the residents of Green Bay and the surrounding Fox Valley area. Our company continues to grow year after year. We started as a one person operation over 10 years ago and now have a full staff of professionals dedicated to serve all of your landscaping needs. We enjoy building long term relationships with our clients by providing the highest standard of quality on each and every project we do. Honesty, ethics, hard work, and customer satisfaction continues to build our reputation which has made Curb ‘n Décor a household name. At Curb ‘n Décor we understand that the outdoor aesthetic of your home or business is as important if not more important than the interior. Our experts will consult with you to determine your project’s needs. We will do our best to advise multiple options when choosing how to complete your unique project. From landscape maintenance to new construction, our residential and commercial clients know that when they call Curb ‘n Décor they will get the best. We serve customers in the Fox Valley area including but not limited to Brown, Calumet, Door, Kewaunee, Manitowoc, Outagamie and Shawano counties. "We just had Bowie and his crew complete a firepit addition with stamped concrete and a concrete overlay to our existing patio and absolutely love it! Very nice crew to work with and we look forward to many evenings around our new firepit!